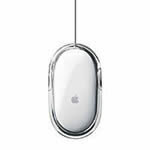 Apple's Mouse combines elegance and precision to deliver a superior mouse experience. Its ideal working with applications like Photoshop which require precision movement. Its adept on most any surface and maintains accuracy even during rapid movement. Apple Pro Mouse in good used condition in stock and ready to ship.